If you are thinking of planning wine tasting tours, California wine country tours are a great choice, particularly for those of us who live in the US. Californian wines have reached a level of respect in the wine world close to that of the great European wine regions. Of course, it is all subjective but many consider some of California's Cabernets, Syrahs, Pinot Noirs, Chardonnays and Zinfandels among the best in the world. That, coupled with the fact that it is closer and cheaper to travel to California wine country for those of us in the US, makes California wine country tours very popular. In fact, some areas for California wine country tours are so popular for travel that much of the area is devoted to hosting visitors and tourists. While that may be a turn off for some people, others love all the amenities and options that creates for them. Which California wine country should you choose? That really depends on several things, including the wineries you wish to visit as well as the type of setting and style you prefer. For example, if you are very new to wine and just want to experience any California wine country tours and tour a few wineries to see how wine is made, then a particular area may not be important to you. On the other hand, if you specifically want to visit and tour Opus One then obviously your destination is decided for you (Napa Valley in this example). Additionally, if you prefer a bigger city with all the amenities that a fully developed tourist destination has in store, like great restaurants, shopping centers, tourist activities, organized wine tasting tours, and great hotels, well then a big, developed wine country like Napa Valley is perfect for you. If you prefer a more rural area with smaller wineries, more quiet and privacy, and quaint, curving roads tucked into beautiful hillsides, well then a less developed California wine country tour might suit you best (like the Russian River Valley or parts of the Central Coast like Paso Robles or Santa Ynez Valley). What is the best way to tour wine country? This is up to your preferences and personal style. We love exploring a new place on our own, planning ahead the places we want to visit, but striking out on our own to discover the unexpected. If you are newer to wine and want more regimented California wine country tours for your vacation, there are many California wine tasting tours which are all inclusive and put together as a package. These are available from various travel agencies and tourist offices in and around California wine country. For more info on the options, see our Wine Country Tours page for an overview of the pros and cons and tips to planning a wine country tour. Here are overviews of some of the general wine country areas in California with a bit of info about each to help you choose. This is not an exhaustive list. There are thousands of wineries throughout California. Napa: Napa is the big mother-ship of California wine country tours. It has been around a long time and has developed into a large tourist area which draws thousands of visitors a year. It is almost an amusement park for adults. While the main part of Napa is very developed and busy with visitors, there are quaint nooks and crannies to be found if you search. Check out the Silverado trail, just east of the main drag (Hwy 29). Some of the smaller wineries off tucked into the hillside are beautiful and fun. Napa makes all sorts of wines (from Sauvignon blanc to Chardonnay and from Zinfandel to Cab), but is really most known for their Cabernet Sauvignon. Sonoma: Just to the west of the Napa Valley is the Sonoma Valley. The cute town square at the southern end of the valley has developed into quite a tourist attraction with many good restaurants and places to stay in that area. However, as you travel north up the valley it gets more quaint with beautiful little country roads and wooded hillsides. 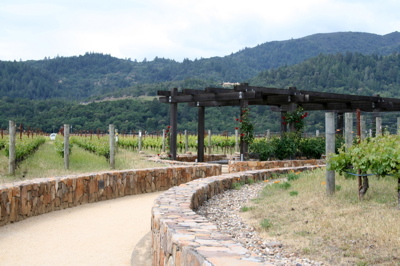 The far northern end of the valley includes areas such as Geyserville, Healdsburg and even the Russian River Valley. All these northernly areas are absolutely beautiful and make for excellent, relaxing country drives, stopping off to taste wine occasionally at wineries. Russian River Valley: This is a river valley at the far northern end of the Sonoma Valley. It deserves special mention because it is both beautiful and also home to some great wineries. This area, a bit cooler than other parts of Sonoma and Napa, is great for growing Pinot Noir, Chardonnay and some Zinfandel. Some of the most famous California Pinot's come from this region. It deserves a special trip to visit. Many of the wineries are small, so call ahead to see if they have open tasting hours or if you need an appointment. Of note, there are many quaint cabins and homes available for rent in the Russian River Valley. It is a beautiful place to stay and to be a starting point for your California wine tasting tours. Central Coast: The central coast is the name given to the middle west part of the state, south of the bay area and continuing down to around Santa Barbara. This is a huge area into which many smaller wine country regions are lumped. Areas like Paso Robles, Santa Ynez, Santa Maria, Santa Barbara, Ojai and others are all in this region. Many of these areas are beautiful and quaint, outstanding places to visit and relax. If you want to get away from the touristy craziness of Napa, these areas are definitely worth a look. Of note, there is a fun little quaint town called Solvang in this area which is an authentic Danish town. It is fun for the whole family and there are numerous restaurants, hotels and gift shops. It does tend toward the touristy side, but you can visit for a day or half-day and see most of it. It is central to many wine producing areas around it so you are not far from several wineries. Amador County: A small, off-the-beaten-path wine country, Amador is a bit east of Sacramento. It is a pretty, quaint area with several excellent winemakers. Particularly known for its Zinfandels, such as those made by Renwood. Done learning about California Wine Country Tours? Return to the Wine Tasting Tours page.